What separates hobby board games from the majority of mass-market titles, aside (arguably) from fun, is the name on the box top. Like the byline on books or the signature in the corner of a painting, hobby board games typically bear the name of their creator. But more than their name, hobby board games typically bear the style of their creator as well. Just as you might expect different things from a book by Kurt Vonnegut than you would from Graham Greene, you can expect different things of a game depending on whose name is on the box top. Alas, I wrote but one entry, on Reiner Knizia. But now it’s time to consider another name you might find on a box top, a name that belongs to one of my favorite designers: Carl Chudyk. What is the Chudykian style? Find out below!Carl Chudyk is perhaps best known for his game Glory to Rome, a tableau-building game wherein players are seeking to rebuild ancient Rome after Nero’s fires. Glory to Rome was released in 2005 from Cambridge Games Factory and has been in and out of print (at least in English) since. More recently Chudyk has paired with Asmadi Games for Innovation (an abstract civilization-building game that focuses on great ideas, inventions, and innovators through history), FlowerFall (an area-control dexterity game that’s exactly what it sounds like), and the forthcoming Impulse and Consequential. Chudyk (and Asmadi) have also had a connection to Iello, with Iello producing a fancier version of Innovation as well as Uchronia, a reimplementation of Glory to Rome. For my part, I’ve played lots of Glory to Rome, Innovation, and FlowerFall and have demoed Impulse. And in my gaming affections, Chudyk is the only designer who has two designs in my top 10 games. What threads tie Chudyk’s games together in my mind? One of my very favorite game mechanisms is cards that do multiple things. San Juan and Race for the Galaxy are games that typically come to mind when people think of this mechanism, but I think Chudyk takes this concept further and gets more mileage out of it than anyone. In San Juan and Race for the Galaxy, for example, a card can either be played to a tableau for its ability or discarded to pay for something else. This is a tough choice, but it’s binary. 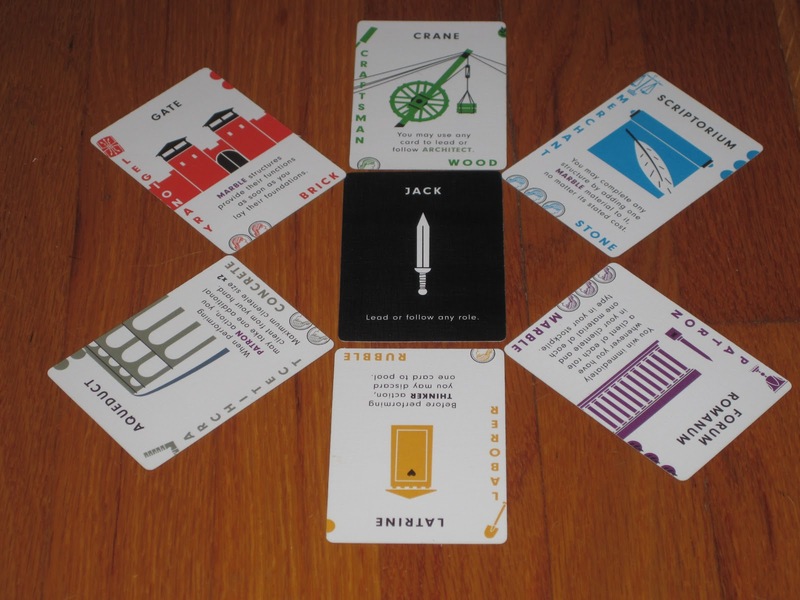 In Glory to Rome, a card can be an order (role), used to lead or follow; a foundation (building in a player’s tableau), giving the player a special ability after completion; a client (allowing a player to permanently perform actions when the client’s order type is led); or a material, used to complete structures or sell on the black market for points. On top of this, choosing to play a card one way has implications for the other players at the table. That’s a lot of decisions to consider for each and every card. 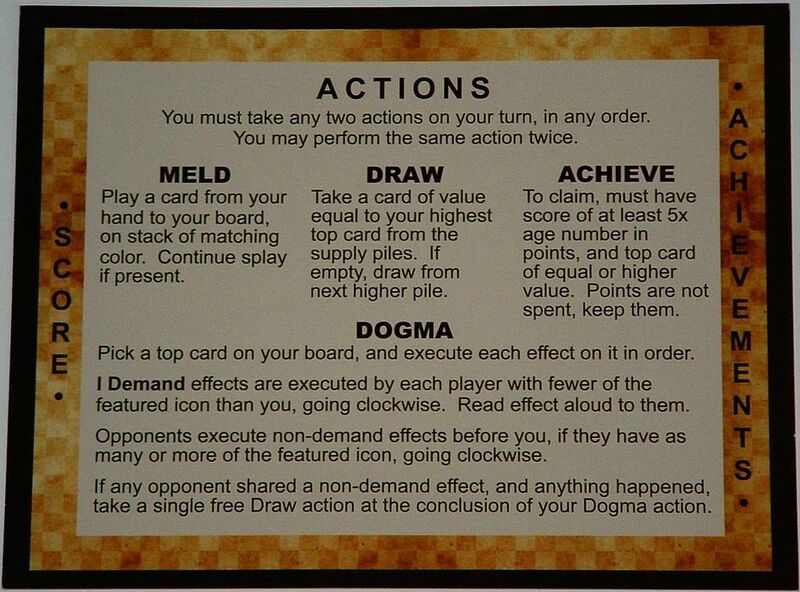 In Innovation, a card can be a card in a player’s tableau (which provides a powerful special action and/or icons that boost an action’s effectiveness), points (if in the score pile), or an achievement (the game’s goal). Impulse’s cards can be technologies, impulse actions, minerals, trade goods, space sectors, and combat modifiers. 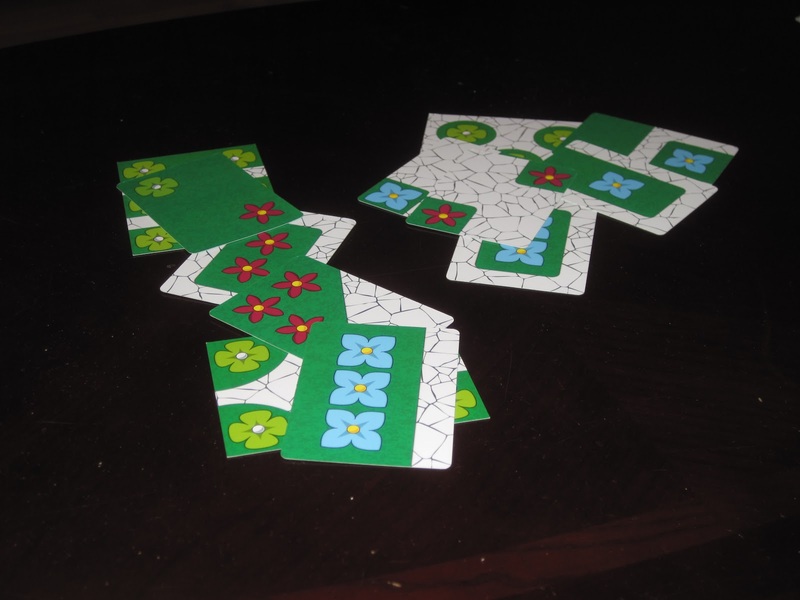 Even FlowerFall has cards with multiple uses, each card offering either a blank field of five points or a unique front with flowers of the player’s color. What these multipurpose cards ensure is player decisions, versatility, and replayability. In the cases of the games I mentioned, it also means a huge game to box ratio with a lower footprint. However, the price of the many decisions afforded by multipurpose cards is an often disorienting entry to the game. While it’s true that once you recognize Chudyk’s style his games are a little easier to pick up, there is still some twist or novelty that separates each from the others. Thus, the first game is usually a learning game. Of Chudyk’s games, I think Glory to Rome has the steepest learning curve, as there are many barriers to overcome just in learning where to place cards and when. There’s a flow to the game in addition to building abilities that must be understood. Innovation, by contrast, has a unique system, but the basic rules are super simple and tied to keywords. However, each of the 110 cards in the game is unique, so the first few games are often players moving blindly (not a bad way to explore). Impulse is also disorienting in that it is similar to Glory to Rome and Innovation, but the twist is the spatial element with ships moving around, and combos are triggered in a different way. (Impulse also rivals Glory to Rome in complexity.) FlowerFall is the least disorienting of Chudyk’s games that I’ve played…but it’s still hard to drop a card where you want it to go. Many have been the games of Glory to Rome when, for example, a player will find a winning strategy and the other players will grumble. However, the next game, if another player attempts the same strategy, it has consistently been thwarted. Here’s the thing: Carl Chudyk’s games are like Dominion: Prosperity. Rather than the constant punishment of Agricola or some Feld titles, where players are strapped from the beginning with modest hopes to merely scrape by, Chudyk gives players crowns and scepters, the stuff of kings, and sets them to work waging epic battles (metaphorically, of course, unless we’re talking about Impulse, which really does have battles). The result is often exhilarating, though at times players who are slower to build their combos can get discouraged. (Chudyk’s games typically reward experience, so it’s best for players to be on a similar skill level.) Even when I’m the one losing, I appreciate Chudyk’s ability to make players feel clever, and I haven’t been convinced that any of these combos is out of balance. The powerful combos can work in each player’s advantage. Chudyk’s designs are an interesting meld of sleek mechanics and often combative interaction. The games hum like Euros but rev like Ameritrash. In Innovation, for example, a player’s decision tree is pared down to four possible actions on a turn (one of which isn’t available often), and players may only do two things. Simple, right? But within this framework is the dogma system, which is full of actions that have direct impact on other players, depending on whether the others have less or equal/more icons of a type than you do. In Impulse, the first thing a player must do on a turn is play a card to the Impulse, a shared action track. Thus, a player is giving a free (and sometimes powerful) action to opponents and must be careful not to help them more than him- or herself. In Glory to Rome, too, each action (as in Puerto Rico) may be shared by the other players. In all of these games, players are constantly sharing actions and finding ways to one-up each other. This interaction keeps these games from getting stale. While players advance in experience of the cards and game system, there is a human factor in each of Chudyk’s games that keeps players from getting too comfortable in one strategy. But these games also offer more than just interaction. In Glory to Rome, the legionary order can steal cards from other players. Innovation’s demand dogmas negatively affect players who have fewer icons of a type than you. And in Impulse, one of the four Xs is to exterminate–and there is plenty of that as players jockey for spots around the core. This kind of direct conflict is often absent from sleeker Euroish games, but it fits well within the context of Chudyk’s designs. 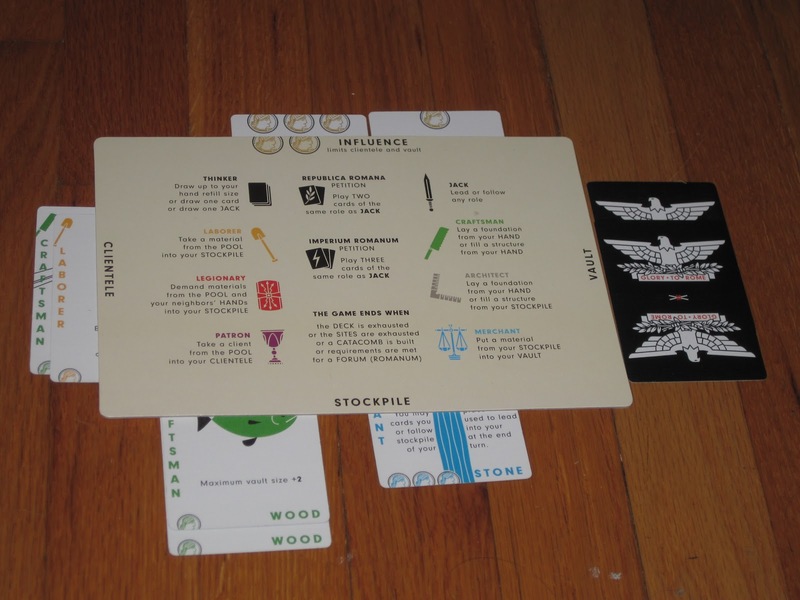 Image borrowed from BGG user EndersGame (I haven’t photographed my own copy yet). The themes for Chudyk’s most popular games seem dry on paper. Rebuilding Rome? A card game history of ideas? A 4X space game that’s just cards? And really–flowers falling? Yet each of these games brings something novel to its genre, something unexpected that breathes life into the game and keeps it feeling fresh. Glory to Rome, for example, while a tableau-building game, is about more than just building a good stable of abilities. While this is important, players must also consider what goes into the “pool,” a shared discard area that all players have access to. Playing a valuable order card may seem attractive; however, giving another player a merchant client is much less so. Innovation is a civilization-building game whose theme is abstract, yet each idea that players control feels considerably thematic in its context. 4X space games are usually many hour (or sometimes day-long) affairs, yet in Impulse, Chudyk has somehow found a way to capture the feel of such a game and boil it down to an hour or less. If you couldn’t tell, I’m a huge fan of Carl Chudyk’s games. What traits did I miss? Happened upon this from a Google Now card. It’s worth noting that Glory to Rome is out of print and going for $150 on Amazon. However, Carl Chudyk and Asmadi Games partnered together to make a spiritual successor, Mottainai. It’s relatively cheap ($15-20) and recently available (September 2015). That’s a huge bummer. I wish the game were more readily available. As for Mottainai, I didn’t care for it very much, but my experience is admittedly limited.